Are you a seasoned Android user looking for ICS on a budget or a learner ready for that big step into smartphones? Is it the journey or the destination? HTC will be pleased to welcome you on board either way. And they're making sure you start on the right foot. Meet the Desire C. The little one at the feet of giants. The adopted child of the blue-bloods in the One family. The HTC Desire C is about half the size of a One X and has only a fraction of its processing power but the C in the name doesn't only signify compact, it also stands for comfort and capability. The Taiwanese have a solid record in the entry-level smartphone segment. To be fair, their pricing is not the most competitive but the build, fit and finish of their smartphones are hard to beat. Beauty anyway is in the eye of the beholder, so here are the solid facts about the Desire C.
That's a long list of features showing HTC have done their homework. Entry-level phones are usually ranked by the best bang-for-the-buck and the Desire C appears equipped well above the average. The biggest doubt is cast by the single-core 600MHz Cortex A5 processor but running Ice Cream Sandwich right out of the box is a nice way to make amends. This market is all about give and take. The Desire C is super compact and lightweight for an amazingly comfortable feel in hand. It's still very well put together and oozes the usual HTC quality. Follow us after the break for more on the design and construction. The HTC Desire C comes with Android 4.0.3 and Sense 4.0 - that's no longer the most recent Android release, but as most of its competitors are still stuck with Gingerbread it's still quite an achievement. We've seen this particular combo of ICS and Sense several times already on the HTC One series phones, but it's still interesting to see it perform on a much cheaper device like the Desire C.
The user interface is trimmed down just like it was on the HTC One V - this time around, it isn't just the small screen but the less processing power too. Anyway, what's missing compared to the One X and the One S is Leap View. The Recent Apps interface is the vanilla ICS layout and the lockscreen cannot be customized: you cannot assign custom app shortcuts - you get Phone, Mail, Messages and Camera, and that's nonnegotiable. There are no different lockscreen types to select from either - the only option the Desire C gives you is the ability to show or hide the default four app shortcuts. The lockscreen is still quite efficient. There are the usual four shortcuts and a ring at the bottom. You can either drag the ring towards the center of the screen to unlock the phone, or any of the shortcuts into the ring to unlock the phone and launch the corresponding app. The number of homescreens is locked at five - like on the One V, you cannot add or remove any. There is no leap view either. You get an auto-hiding indicator of which screen you're on and a brand new dock with five shortcuts - the middle one is locked to the app drawer, while the other four can be customized as you please (you can even put a folder there, if four shortcuts isn't enough). Sense offers one of the most full-featured customization suites around. The proprietary Scenes interface lets you choose from various custom homescreen setups, which provide new wallpaper and widget sets that can be further customized to suit your needs. This version of Sense only comes with one preloaded, but hitting the 'Get More' button on the upper right will take you to the HTC Hub where you can download additional Scenes. Switching between scenes takes a couple of seconds, but they're a handy feature if you want to quickly change your phone's functionality, such as going from work to home. The HTC Sense has another customization option called Skins. Every skin changes the look and feel of most of the onscreen buttons, application screens, option menus, and other items. They also come with unique wallpaper each and use different colors for various UI elements. The Desire C comes with a total of two preloaded skins, although like with Scenes, it's easy to get more. The main menu has the typical grid layout, which is composed of vertical pages with shortcuts sorted alphabetically. You can set different sorting options - alphabetical, most recent or oldest - but you can't rearrange them manually. There are Search and Play Store shortcuts along with a menu for some options. The App Drawer uses a tabbed layout similar to different Sense elements (such as the phonebook). There are three tabs available at the bottom - All apps, Frequent and Downloads. You can rearrange them or remove Frequent and Downloads if you don't need them. Adding widgets to the homescreen is done in a similar fashion to Honeycomb and is one of the less successful changes since Sense went ICS. The main problem here is with how widgets are selected - they are shown four at a time and there's a lot of scrolling involved. Widgets are available in multiple versions - usually differing in size, but also functionality - and they're all dumped into the list, so you're scrolling through a lot of duplicates. The old setup of picking a widget and then adjusting its size (if applicable) seemed simpler. Editing the homescreen is different from vanilla Android. You can tap and hold on a widget and you can drag across homescreen panes. While you're dragging a widget (or shortcut or whatever), two fields appear at the top of the screen - Edit and Remove. You can drop the widget on either one to perform the corresponding action. When it is highlighted, Edit can be used to modify the settings of a widget - e.g. choose a different folder for the Photo Frame album or even choose a different version of the Clock widget. This saves you the trouble of first deleting a widget and then putting it on the screen again to choose a different version, setting and so on. The notification area no longer has the list of recent apps - it's reserved for notifications only. No more tabs and toggles either, although you get a Settings shortcut here if you need to power something on or off. There's also a Clear button to dismiss all notification or you can swipe them off one by one. Pressing the task switcher button on any screen displays a list of all your recently accessed apps, which you can remove with a swipe to the left or right. This is really just a quick way to access apps you've used recently, as swiping away doesn't kill them. To actually terminate a running app, you have to close it via the traditional task manager we've become familiar with from Gingerbread. It's simple to use - each running app is listed with an indication of how much RAM it's using (no CPU usage reading though). You can terminate apps one by one and there's a Stop All button too. The Desire C has HTC's elaborate phonebook with deep social networking integration. It manages to keep things neatly in order, even though it's juggling everything from SMS to Facebook photo albums. The entire People app (the phonebook) is tabbed - you have your contact list, groups (including favorite contacts there), as well as a call log. Once again, you can reorder tabs and remove the ones that you don't need (Groups or Call history). From a drop-down menu at the top, you can filter contacts based on where they came from - the phone's address book, Google contacts, Facebook, or your HTC Sense account. If an account has multiple subgroups (e.g. Gmail's groups), they can be toggled individually as well. The second tab holds the texts, emails and call history between you and the given contact. The next one displays social networking contact updates, and the fourth one called "Gallery" pulls up all the albums that contact has created on Flickr or Facebook. When editing a contact, you start off with just one of the essential fields but you can easily add more. You can link to another contact or Facebook account pressing the "chains" icon in the upper right of the main contact screen. The transfer app is here to help you switch from your old phone. It supports many phones from major manufacturers and moves the data over Bluetooth. It's an old but useful feature. The HTC Desire C had no problems with reception and the in-call audio was clear and satisfyingly loud. The dialer on the Desire C displays your recent calls and the list of favorite contacts underneath. Once you start typing on the keyboard, contacts will be filtered by name or by phone number. The Desire C packs the standard set of accelerometer-based tricks - turning the phone in the middle of a call will enable the loudspeaker, Quiet ring on pickup will reduce the loudness of the ringtone when you move the phone and Pocket mode boosts ringtone volume if the phone is in your pocket or purse. Here's how the HTC Desire C fares in our traditional loudspeaker performance test. It scored an Average mark placing just below the halfway point of our ranking. Android and the Desire C are capable of handling all sorts of messages - SMS, MMS, email. Social networking is covered by several apps and widgets, and there's the Google+ Messenger, which can connect you to Google's chat network. Text input on the Desire C boils down to an on-screen custom-made HTC virtual QWERTY keyboard. Texting takes a bit of getting used to in portrait mode, which is understandable given the small screen size. Still, it's enough to get the job done and things get a little better if you flip the phone to landscape mode. Converting SMS into MMS is as simple as adding some multimedia content to the message. You can either add a photo or an audio file to go with the text, or you can get creative with several slides and photos. The HTC Desire C comes with two email apps - the traditional Gmail app and the generic HTC Mail app, which merges all your email accounts into a single inbox. You can add multiple accounts (from multiple mail services) and view them individually or in a combined inbox. Each account is color coded, so you can quickly associate each message with its relevant account. There's hardly anything we can think of that the Desire C lacks in terms of email capabilities. The settings for popular email services are automatically configured. POP/IMAP accounts and Active Sync accounts are supported too. The HTC Desire C supports multi-touch and you can take full advantage of it while browsing your images. You can zoom up to 100% with a simple double tap on the screen. The implementation here is extra smooth too. There's no dedicated video player onboard the HTC Desire C, which means that video files have to be accessed via the Gallery. Video support on the Desire C was a mixed bag - as expectd, 1080p and 720p videos were a no go. It was able to play most standard resolution file formats we threw at it - AVI, MP4, MKV - though it did choke on some old XviD-encoded AVI videos. Unlike the One series, Beats Audio enhancement is not available when viewing videos; it only works when listening to music (more on this below). The Music app starts off by offering you several shortcuts - music library on the phone, SoundHound track recognition or TuneIn Radio. Below is a list of all your recently played songs, and at the bottom there is a ticker for the currently playing song. The Desire C offers the Beats Audio sound enhancement to boost the sonic experience, although at a slightly dumbed-down variant. Gone are all the Beats Audio presets we're used to in other HTC phones, all you're really able to do on the Desire C is toggle it on and off. The HTC Desire C is also equipped with an FM radio, which has a pretty simple interface. It automatically scans the area for the available stations and allows you to mark some of them as favorite. It also supports RDS and allows loudspeaker playback. Despite its modest price tag the HTC Desire C did quite well in our audio quality test. In fact it turned out to be one of the best HTC smartphones we've ever subjected to the test. What's even more surprising is the very little degradation when headphones come into play. The stereo crosstalk rises the tiniest amount (and remains probably the best we have seen in this scenario) and the intermodulation distortion spikes a bit. Kudos HTC!. The HTC Desire C packs a 5MP fixed-focus camera that does stills of up to 2592 x 1944 pixels and records VGA video @ 30fps. There is no LED flash and no shutter key either. Given the lack of autofocus the lack of a dedicated camera is hardly as big an issue, but it still would have come in handy for quickly accessing the camera app. The camera interface is the same for both the still camera and the video camera - no they don't "look alike", the camera just has the UI shared between both functions, with the option to either take a video or snap a still image all from one screen. The right-hand side features the Effects button, shutter key, camcorder record key and a shortcut to the gallery that shows the last photo/video taken. On the left are buttons for general settings and shot mode. To snap a photo, you tap the shutter button. To record video, you tap the button below it. The dual interface is convenient to say the least, but it does have a few drawbacks. For one, if you're shooting video at the highest resolution possible, VGA, once you hit the record button the frame shrinks down to 4:3. This can make framing a bit tricky, as you don't get to see the actual dimensions of the image until you start recording. The effects button brings out a panel with the usual set of color effects (sepia, solarize and so on), while the shot mode button offers just a few very limited options - portrait, landscape, and low light. As far as the quality of the shots is concerned, the Desire C definitely leaves something to be desired. In our tests it had a hard time getting the white balance correct, and a lot of our outdoor images had some color deviation and underexposure issues. When it works as it should, the level of detail and color rendering is pretty good, although up close photos do have a grainy look . Overall, the camera is certainly not the best we've seen from, but considering the low-cost package, it could have been worse. The HTC Desire C joins the other 5MP shooters in our Photo Compare Tool. The tool's page will give you enough info on how to use it and what to look for. The VGA (640 x 480) recording capabilities of the Desire C are nothing to write home about, especially in this day and age when it seems that every other device out there is capable of 720p recording. If you can get past the low resolution, the camcorder itself has quality similar to that seen in the still image samples - slightly-skewed white balance which leads to rather dim outdoor images, and color reproduction that is otherwise accurate. Videos are stored in MP4 files and have a variable framerate which generally hovers around the 29fps mark. 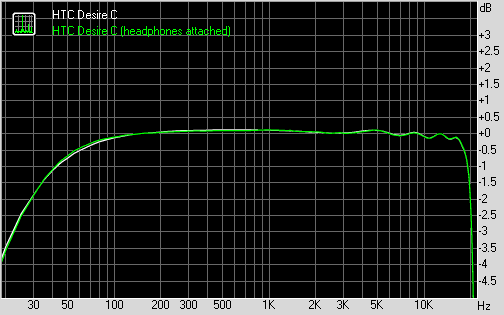 Audio gets recorded at a sampling rate of 44kHz and a bitrate of 96Kbps. The HTC Desire C offers quad-band GSM/GPRS/EDGE and tri-band 3G, and HSDPA speeds of up to 7.2 Mbps. Local wireless connectivity features Wi-Fi b/g/n and Bluetooth 4.0. You have a long list of options for connecting to a PC - Charge only, Disk drive (mass storage), HTC Sync, USB tethering (use the phone as a modem) and Internet pass-through (the phone uses the computer's Internet connection). The Charge only and Disk Drive have big, thumbable icons, which is great since they are most often used. The app can be set to power off automatically after 5 or 10 minutes of inactivity, saving your battery in case you forget to switch it off manually. The HTC Desire C comes with the latest Android web browser, and because it runs on Android Ice Cream Sandwich, you can also install Chrome for Android. Anyway, the browser's interface keeps mostly out of sight, which leaves the entire screen to the web page. You get the standard Menu dropdown on the right, but HTC have thrown in some extra buttons at the bottom of the screen (you have to pan to reveal them, which is a little annoying). They let you save a page in your bookmarks or reading list, view bookmarks, saved pages or tabs. You might want to enable Quick controls - they let you tap on any point on the edge of the screen and move your finger to select the desired option from a jog-dial menu. Once you select some text, you can copy it, do a Google search with that text as the query or share the text over a message or social networking. Tabs can be closed with an X button on their top right corner. Incognito tabs are available if you want to bypass History, tracking cookies, form auto-fill stuff and so on. The Menu options include a toggle to enable/disable Flash and another one to request the desktop version of a site, instead of the mobile one. Another ICS feature has the phone preload search results that it suspects you're going to open, speeding up the whole process. The Desire C comes with Flash support, although the 600 MHz processor has a hard time keeping up. Clicking the 'Enable Flash support' option in the browser settings allowed for all the flash banners on our site to show up, but made the browsing experience so choppy it was pretty much unusable. YouTube videos will load and play in-line, although a lot of times it takes a while for them to show up. Flash games failed to run altogether. The usual set of organizer apps are aboard the HTC Desire C, with a mobile Office app to boot, that can both view and edit documents. The Polaris app has support for viewing Word, Excel, and PowerPoint, including the Office 2007 versions and it can create Office 2003 Word, Excel documents and presentations. There is also a PDF viewer to handle PDF files. You can format the text style and color, justify the text, do lists (numbered or bullet points) in the Word editor. The Excel editor does support function editing, which some mobile editors don't. The app also integrates with Dropbox and SkyDrive, which makes syncing documents between your computer and your phone a breeze. The Calendar supports multiple online calendars (including Facebook), one you sync with your computer and easily show/hide events you don't want. The Desire C features an alarm clock application, which can handle multiple alarms, each with its own start and repeat time. You also get a stopwatch and a timer in the same app. There's a world clock, to display the time in multiple locations, as well. The Voice recorder might be quite useful for making audio notes and the weather app brings Yahoo's weather forecast for your area a click away. Not quite an app store, the HTC Hub is a good sourceof wallpapers and sound customizations - ringtones, alarms and notification sounds and entire sound sets (a set is a whole package that brings together the other three categories). There are also a handful of apps, as well as customizations for skins and entire scenes as well. The HTC Desire C has a built-in GPS receiver, which managed to get a lock in under a minute (with A-GPS switched off). If all you need is a rough idea of where you are (within 150 meters) you can use the Cell-ID and Wi-Fi network lock, which is very fast. At this point, Google Maps is a standard part of the Android package and we've covered it many times before. It offers voice-guided navigation in certain countries and falls back to a list of instructions elsewhere. You can plan routes, search for nearby POI and go into the always cool Street View. HTC has stepped out of its comfort zone with this one. It's not their first attempt at a smartphone for the masses and the Taiwanese are definitely getting the hang of it. The Desire C is firmly in the tradition of the two Wildfires and the Explorer. By another tradition honored by HTC, even their entry level offerings get the latest software and the combination of Ice Cream Sandwich and Sense 4.0 is the phone's key selling point. What we have here is a trimmed-down version of the Sense UI but it's by no means a massive deal-breaker. After all, even the HTC One V had to accept cuts like the missing leap view and the non-customizable lockscreen. Anyway, with microSD card support, flash playback and ICS, the Desire C is a pretty good catch. Desire C is with a bigger and higher resolution display, an autofocus camera, and a clearly more capable processor. The limited storage capacity and an app market that's not nearly as well-stocked as the Google Play store are points against. The flipside is, the hardware doesn't quite keep up. It's actually as low-end as it gets. But it suffices for two things - run Ice Cream Sandwich glitch-free and stay within budget. The Desire C is clearly cheaper than some of its direct competitors and that's fairly surprising coming from HTC, which usually prices its phones quite steep. The premium is well worth it most of the time, considering the solid build quality of the gadgets. To sum it up, HTC seems to be taking the entry-level market more seriously than usual. Just look at the multiple versions of the Desire C, including dual-SIM support. Of course, HTC's entry level is different than say, Samsung's. What we mean is, there're obviously cheaper ways to own an Android smartphone. But the HTC Desire C is among the few to give you ICS right out of the box. It looks good and is really comfortable to handle - clearly, it's an easy phone to like. Maybe it would be a lot harder for many people to forgive the slow, outdated processor. To be clear, most people won't call the Desire C slow, unless they're holding a dual-core in the other hand. That's the thing, though - the other hand.